MarketingExperiments was the first web-based research lab to conduct experiments in optimizing sales and marketing processes. 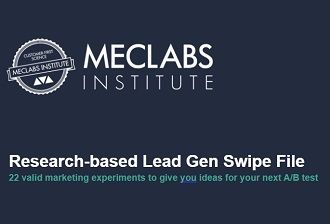 Today, with multiple optimization indices and formulas MarketingExperiments, as part of the MECLABS Institute, is forging research partnerships with key companies such as The New York Times, Google and Verizon. These partnerships are driving more breakthrough discoveries and have enabled MECLABS and the MarketingExperiments publishing branch to develop the world’s largest collection of optimization-related experiments and case studies. We publish everything for free online for easy access to our research library. Through our research, we have been fortunate to collaborate with many of the web’s leading thinkers. We are grateful for everyone’s help and insights. And though we still have more questions than answers, we are truly committed to discovering what really works. Hannah Martin, Research Manager, MECLABS Institute Hannah’s role at MECLABS involves working with Research Partners and creating and optimizing test strategies, analyzing results and assisting with day-to-day responsibilities. Before joining the team, she worked as a Project Coordinator at Kessler Creative, a company specializing in print marketing and direct mail services. Hannah earned her B.S. in communications with a concentration in public relations and minored in psychology at the University of North Florida. In her free time, Hannah enjoys cooking, baking, crafting and watching football. Linda Johnson, Copy Editor, MECLABS Institute Linda oversees the technical integrity of the content for MarketingExperiments, MarketingSherpa and MECLABS Institute. She places special emphasis on clarifying the writer’s intentions while preserving the writer’s voice. But first and foremost, Linda is an educator. Before joining the team, she was an educational consultant, a blogger and a freelance writer for various print and digital magazines. Her focus is on simplifying complex topics for all kinds of learners, including aspiring marketers. Linda believes in living life on purpose. Several other MarketingExperiments team members, present and retired, also contribute to this blog, including: Zuzia Soldenhoff-Thorpe, Dr. Chuck Coker, Kaci Bower, Adam T. Sutton, David Meerman Scott, Joelle Parra, Heather Andruk, Hunter Boyle, Greg Burningham, Adam Davis, Peg Davis, Jimmy Ellis, Anna Jacobson, Andy Mott, Aaron Rosenthal, Arturo Silva, Corey Trent, Nick Usborne, Dustin Eichholt, Brad Bortone, Eric Coffman, Warren Staley, Allison Banko, John Nye, Erin Hogg, Taylor Kennedy, Nathan Thompson, David Kirkpatrick, Alex Abell, John Tackett, Michael Rendon, Sam Caruso, Carmen Weeks, Matthew Hertzman, Taylor Lightfoot, Eddie Lutz, Daniel Beulah, Lauren Pitchford, Kayla Cobb, Anuj Shrestha, Dave Green, Josh Wilson, Jessica Lorenz, Shelby Dorsey, Ben Huppertz, Kylie Hyer, Joey Taravella, Jon Powell, Spencer Whiting, Diana Sindicich, Andrea Johnson, Benjamin Filip, Maria Hendricks, Emily Munns, Lindsay Johannesen, Amy Tulley, Martha Faulk, Liva LaMontagne, John Durrett, Kayla Wainwright, Regina Love, Micah Shull, Gina Townsend, Michael Powers, Selena Blue, Mike Xiao, Scott Howard, Derrick Jackson, Ken Bowen, Gregory Hamilton, Scott Snodgras, Brian Street and Shaniah McGlaughlin.